Régilait, French Milk Powder, is launched in Singapore! French milk giant, Régilait, is finally here in Singapore! After its recent expansions in the Asian regions, 4 of their non-fat canned milk has made its way to shelves here in major supermarkets. What is Regilait? Simply put, its name, in French, literally means 'diet milk'. So, ackhem, ladies. After 1.5years of going through strict product checking, the brand has been awarded the 'Healthier Choice' and 'Halal' certifications. May I also add that this brand of milk is also totally good for vegetarians to enjoy? As Regilait is a French dairy cooperative, it controls the entire chain of milk production, from procurement at farms, to manufacturing of the final products. Its quality is assured. While they have a wide range of milk products, only 4 types have come to Singapore for now. They are all non-fat and each have their own specific uses and target audiences. Here are the 4 available milk types launched in Singapore since a month ago. This one is mainly targeted at those who are keeping to a strict calorie counting regime. It is best suited for diabetes or consumers with high cholesterol levels. Drinking this milk helps to restore a balanced diet, and best part - one glass (250ml) only has 89kcal! This one is targeted at those who wants to build up strong bones, and still not pack on the love handles. Especially for ladies, we are more prone to osteoporosis than men. This formula is easily absorbed and becomes well fixed in the bone when consumed. Just drink 2 glasses (250ml each) of the fat-free Calcium Plus to meet daily calcium needs. Stay awake and more energetic with this formula! There are 8 nutrients which are fortified within the milk formula, and contains vitamins A, D3, C, B1, B2, B6, B9, B12! This is a low-fat formula, which contrains 14% more calcium and 25% less saturated fat than a regular dried milk, while still preserving all the nutri-goodness of the milk. It's the one with the creamiest taste amongst the rest. It doesn't have a heavy milky taste, just nice for enjoyment. It is very convenient to prepare as the powder dissolves in water instantly (I saw it in front of my eyes), as it has gone through a unique granulation process. Regilait is the only milk company to obtain such a process. It dissolves totally with a quick stir, in both hot or cold water. The milk powder is 100% real pure cow's milk with no fillers added, no maltodextrins, but yet doesn't let down on the proteins and nutritional values contained within. It does not curdle, staying true of its non-fat label. During the media launch for this product, we were treated to a deeper understanding of the brand, bone nutrition and why drinking good milk is important, as well as shown a live cooking demo by Chef Lisa, who used the milk powder to whip up healthier delicacies like chicken curry, and banana, strawberry and chocolate milkshakes. We all could attest to the awesome taste. Too easy to make too! I will be doing my own version and sharing the recipes with all in a separate post. Meanwhile, the milk is good to drink on its own as well! 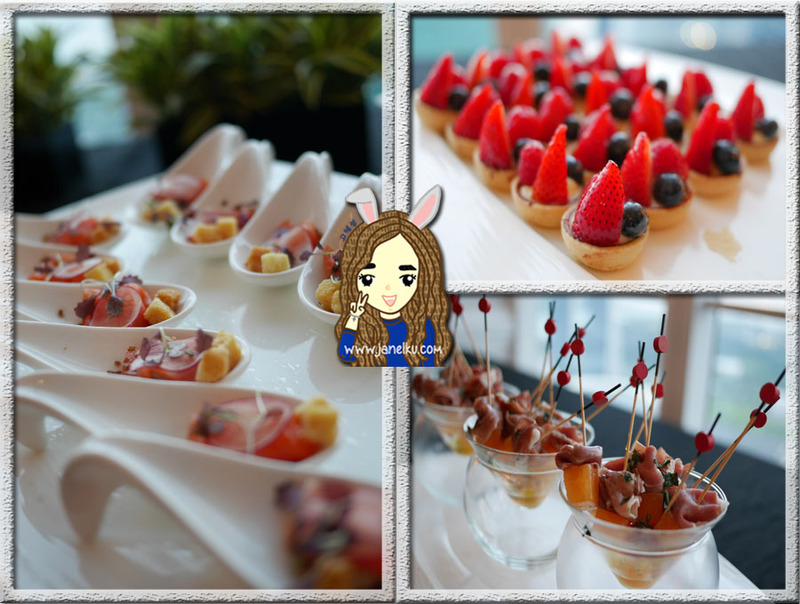 Lovely goodies we enjoyed before the event started! 1. Pour in about 250ml of cold or hot water in a glass / cup. 2. 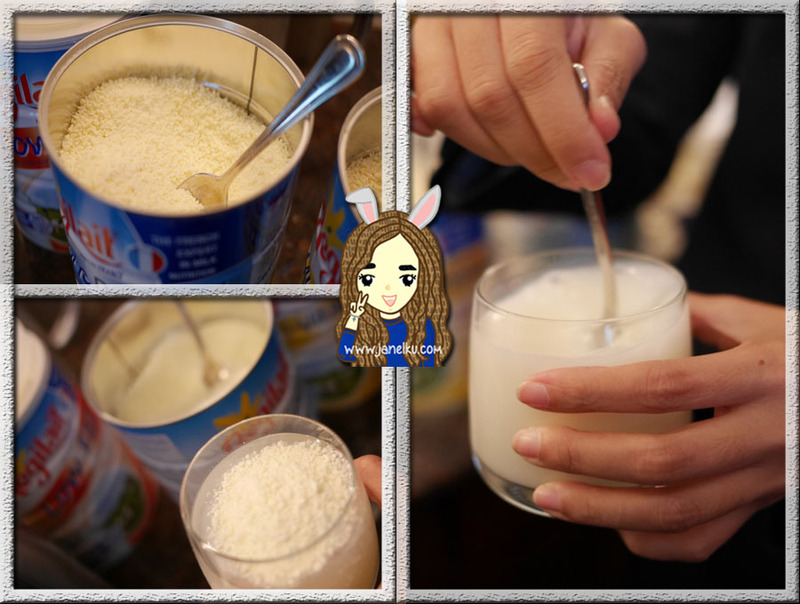 Take about 3 tablespoons (or 6 teaspoons) of the powder and put it on top of the water. 3. Give it a quick stir and it should dissolve entirely, ready for your consumption! If you would like it slightly more 'creamy', like the off-the-shelves milk, perhaps you could add another 0.5 - 1 teaspoon of powder into the water. The milk is best drank by everyone above 3 years old, as toddlers have specific needs which may not be best met by this milk.